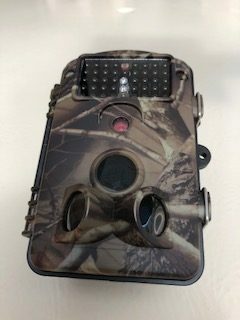 The scouting camera (also called a game/trail camera ) is a scouting device. It can be triggered by sudden change of ambient temperature caused by moving game in the area of interest, which is detected by a highly sensitive Passive Infra-Red (PIR ) sensor, and then take pictures or video automatically. A 32 GB SD card is supplied with this camera.